Yesterday we made some big updates to Windows Azure Mobile Services! The feature suite for Windows Store apps is growing and you can begin using Mobile Services to develop native iOS apps. You can also check out Scott Guthrie’s blog post for more information regarding this update. The Mobile Services team is very proud to honor the wider Windows Azure commitment to open source development. We previously announced that iOS development was in the works, and today we’re happy to share an update on our progress. The most current iOS are available on GitHub, you can now access the iOS Quick Start project in the Windows Azure portal, and find tutorials in the Mobile Services dev center. The current libraries support structured storage, the full array of user authentication options (Windows Live, Facebook, Twitter, Google), email send through SendGrid, SMS & voice through Twilio, and of course allow you to access Blobs, Tables, Queues, and ServiceBus. A simple push notification service for iOS is not currently supported. Look for subsequent preview releases to deliver a complete solution for iOS and to add support for Android and Windows Phone! Mobile Services are still free for your first ten applications running on shared instances. With the 90-day Windows Azure free trial, you also receive 1 GB SQL database and 165 MB daily egress (unlimited ingress). Both iOS and Windows Store apps count towards your total of 10 free Mobile Services. The Windows Azure Mobile Services team is very excited to announce that we’re building on our partnership with SendGrid to deliver a turnkey email solution for your Mobile Services app. We’re teaming up to make it easier for you to include a welcome email upon successful authentication, an alert email when a table is changed, and pretty much anything else that will help you build a more complete and compelling app. You can add email to your app in three simple steps. First sign up here to activate a SendGrid account and receive 25,000 free emails per month through the introductory SendGrid + Windows Azure offer. Once you receive approval from SendGrid, login to the Windows Azure portal and navigate to the DATA tab on your to-do-list getting started project. That’s it. Now every time one user updates the todo list, the other users will get an email letting them know what needs to get done. Visit the Windows Azure Mobile Services dev center for the full tutorial. Our friends at SendGrid have also put together a tutorial for sending a welcome email on successful authentication. If you’re fired up about how you added email to your Mobile Services app, let us know! You can review how to use SendGrid with all Windows Azure services here. Today at TwilioCon, Scott Guthrie’s demo showed just how quickly you can add SMS capabilities to your app through Twilio and Windows Azure Mobile Services, and just how powerful that end product can be. Head back to the Windows Azure portal and navigate to the DATA tab on your to-do-list getting started project. If you want to show off how Twilio is making your Mobile Services app even better, tell us where to look! 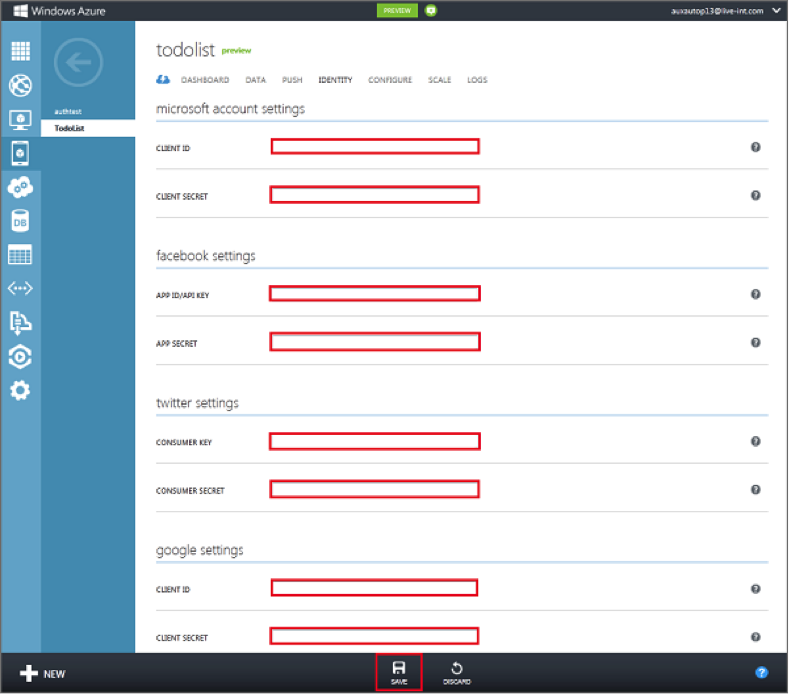 You can review how to use Twilio with all Windows Azure services here. Microsoft account authentication was part of the initial August preview launch and thousands of you have incorporated that into your Windows Store apps so far. Today, we’re expanding your authentication options to include Facebook, Twitter, and Google. To add any of these authentication options, you first need to register your app with the identity provider of your choice. Then, copy your Mobile Service’s URL from the Dashboard (https://<yourapp-name>.azure-mobile.net) and follow the appropriate tutorial for registering your app with Microsoft, Facebook, Twitter, or Google. Each of these tutorials will show you how to get a client ID and secret key, which you will then need to paste into the appropriate location on the identity tab. Don’t forget to hit Save! The tutorials in the Windows Azure Node.js dev center will tell you everything you need to know about starting to work with Blob, Tables, Queues, and ServicesBus using the azure module. Until now, you’ve only been able to deploy Mobile Services to the US-East data center. Now you’ll also be able to deploy Mobile Services to the US-West data center. Manage cost and latency by deploying your Mobile Service and SQL database to the same data center. If you are creating a new database, simply select the same data center in the drop down as you did for your Mobile Service. If you are connecting an existing database to a Mobile Service and need to move to a new data center, instructions for how to do so can be found here and here. You can deploy different Mobile Services to different data centers from the same subscription. If you upgrade a Mobile Service in one data center to Reserved instances, you must also upgrade all other Mobile Services you have deployed to that data center to Reserved instances. For example, consider a scenario where you have four Mobile Services—A, B, C, and D—and the first two are deployed to the US-East data center but the second two are deployed to the US-West data center. If you upgrade Mobile Service A to Reserved instances, Mobile Service B will automatically be upgraded to Reserved instances as well because both are in the US-East data center. Mobile Services C and D will not automatically be upgraded since they are in a different data center. If you later choose to upgrade Mobile Services C and D to Reserved instances, those charges will appear separately on your monthly bill so that you can better monitor your usage. You still receive 10 free Mobile Services in total, not 10 per data center. You can of course still deploy to US-East, if you prefer. Later this month we will add support for the Windows Server 2012 and .NET 4.5 release. In that update, we will enable new web and worker role images with Windows Server 2012 and .NET 4.5 as well as support .NET 4.5 with Web Sites. If you have questions, ask them in the forum. If you have feedback (or just want to show off your app), send it to the Windows Azure Mobile Services team at mobileservices@microsoft.com.